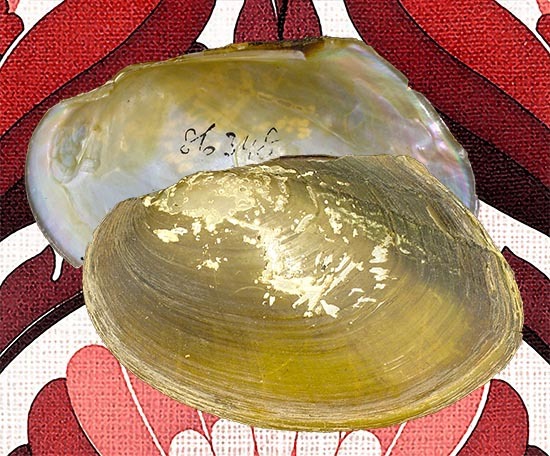 The February 2019 Mussel of the Month is Monodontina vondembuschiana. Monodontina is a genus of four species from southeastern Asia, from Indochina to the Sunda Islands. USNM 86348. Java [Indonesia] (type). Monodontina vondembuschiana is the type species of the recently recognized genus, Monodontina. M. vondembuschiana has traditionally been classified as a Pseudodon (Zieritz et al., 2018), but that genus has been blown-up by the phylogenetic work of Bolotov et al. (2017). In our global checklist (Graf & Cummings, 2007), we divided the almost two dozen species of Pseudodon among nine subgenera. There were only a handful genera that caused us to worry about subgenera back then — Alasmidonta, Arcidens, Lasmigona, Parreysia, Pseudodon, Prisodon, and Hyridella. These were generally taxa with many species and either some suggestion that they might be excessively lumped or just in need of clarification how the taxonomy we followed corresponded to other classifications. Some of those lumpings have been rectified, such as Prisodon sensu latu (= Prisodon sensu stricto and Triplodon), Parreysia s.l. (= Parreysia s.s., Leoparreysia, Indonaia, and Radiatula), and Pseudodon s.l. The former species of Pseudodon s.l. are now split among Pseudodon s.s., Monodontina, and Bineurus based on the non-monophyly of the old genus (Bolotov et al., 2017). Either Pseudodon needed to be broken up or the species of Pilsbryoconcha had to be folded in. So, where there were two genera, we now have four. The phylogenetic relationships among the other six subgenera of Pseudodon have yet to be fully explored. Bolotov, I.N., I.V. Vikhrev, A.V. Kondakov, E.S. Konopleva, M.Y. Gofarov et al. 2017. New taxa of freshwater mussels (Unionidae) from a species-rich but overlooked evolutionary hotspot in Southeast Asia. Scientific Reports 7: 11573 (18 pp. ).